Rockwall Metal Roofing is a Locally-Owned and Operated Roofing Repair and Replacement Company, serving Mesquite, Forney, Balch Springs, and Garland. Our owners and founders are DFW natives, fully knowledgeable of what effect Texas weather has on Texas Roofs, Shingles, Gutters, etc. We are a Full Service Home Improvement Company, repairing and installing everything to make your home Safe and Secure from the weather. From Roofs to Gutters, Siding to Windows, we do it all. That's not to say we don't specialize in what we do. We only do work in the areas we specialize in. Those can be found in our 'Services' area above. We believe that our Customers deserve 100% of our attention and dedication. We are #1 in Customer Service among Roofing Repair Companies and Contractor Services in Rockwall, TX. We would love to partner with you in your roofing or home improvement needs. At Rockwall Metal Roofing, we would love to exceed your expectations! 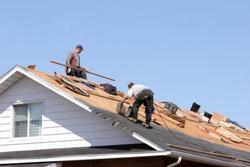 We also provide Roofing Repair and Replacement in Garland, Tx!